Like soccer, the 15-man code of rugby football (not to be confused with 13-man rugby league) has its global showpiece tournament every four years, and the 2015 version kicks off in England today. Just as with the FIFA World Cup, all 20 teams involved will be sporting new home and alternate uniforms, which range from the clean and classy to the downright obscene. Rugby union was an amateur sport until 1995. In the 20 years since, professional rugby shirts have changed a lot from the baggy, cotton, long-sleeved, polo-collared style that most people would associate with the sport. Modern rugby shirts are made of cutting-edge fabrics, are skin-tight, and usually don’t have much of a collar, to reduce the chance of being tackled by an opposition player. That said, most fans and many players still prefer the old-school look, not least those who carry a little more timber around the midriff, so many modern shirts aim to strike a balance between classic and modern designs. Notes: The tournament hosts kept things clean and classic for their jerseys, with the only real ornamentation being the chevron grip surface (a sticky, tacky substance designed to make catching the ball in wet conditions easier). The big talking point however, was the famous red rose, which has been 3D injection-molded — a world first, according to Canterbury. Notes: The Wallabies’ home shirt went down like a fart in a lift upon its reveal, mainly due to the green “shoulder pad.” It’s perhaps not the best look but definitely looks less incongruous on the white change strip. Notes: Rugby fans are nothing if not traditional, and Under Armour’s inclusuion of gold and “oxblood” in the Wales jersey — two colors with no association to this rugby-obsessed country — invited some unkind comparisons from fans. It’s pretty nice, though, like a ’70s soccer shirt. The change shirt’s tone of “anthracite” is somewhere between grey and blue. Notes: These initially seems like two pretty plain shirts, but they actually have some nice touches to honor Fijian culture. Down the ribs you’ll find a traditional “tapa” motif, and sublimated into the chest is a representation of the “civavonovono” — a traditional Fijian breastplate worn by tribal leaders. Cool. Notes: As one of the minnows of the tournament, Uruguay has been given a pretty dull and tacky shirt. With a mix of pinstripes, slashes, and a weird upturned collar, it’s hardly one for the ages. 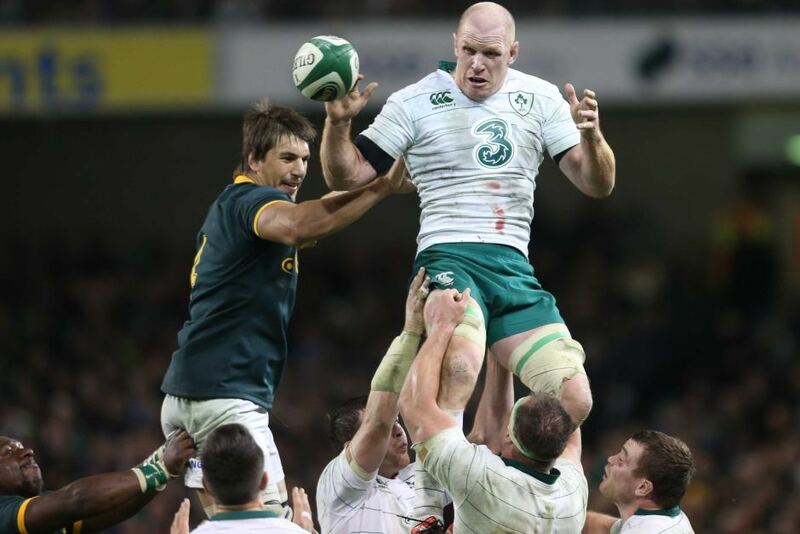 Notes: The Springbok jersey has always been green with gold trim, but it’s rarely had quite this much gold in it. The sleeve pattern is sort of half a Northwestern stripe but has also drawn more than a few Green Bay Packers comparisons. What’s Afrikaans for “Cheesehead”? Notes: If there’s one shirt that’s really got people talking in this tournament, it’s Samoa’s. Covered in an intricate, sublimated pattern inspired by traditional Samoan art, the home and change shirts do a really nice job of emphasizing different aspects of this hugely detailed design. Notes: The Scotland shirts are a wonderful throwback to the good ol’ days — a clean, classic-style shirt with the all-important fold-down collar. The only bit of ornamentation is about as Scottish as it comes, with the SRU’s own tartan adorning the sleeve cuffs and ribcage. Notes: The Eagles have been channeling their inner dream team, clearly, as this both of these shirts lay on the stars and stripes pretty heavily. The home shirt is all classy pinstripes and subtle stars, which looks great, while the alt mixes wild and restrained with some subtle decreasing hoops contrasting a proper galaxy of stars around the shoulders. ’Murica. Notes: Hooped jerseys are a big part of the heritage of rugby union, and many modern apparel suppliers look to put a modern twist on it. Canterbury has opted for a curved effect on the Brave Blossoms’ shirts, and it works really well, especially on the alternate. Notes: The reigning world champions are the favorites again this time around, and they have one of the most iconic jerseys in sport. This year’s edition is slightly different from the norm, however, due to the chevron around the shoulders, which is a nod to the jersey of the original 1905 touring team that first bore the name All Blacks. Notes: The Pumas’ blue/white hooped shirt is a classic, and it’s no surprise Nike’s very traditional take has been well received, but the real pick might be the dark blue change shirt, with its eye-grabbing neon blue accents and subtle puma-print pattern around the waist. Notes: Another Pacific island nation, and another tasteful incorporation of traditional tribal art into the design. The band over the single shoulder is an interesting look, however, and it’s balanced out by the presence of the Royal Crown of Tonga on the left ”“- subtle but effective. Notes: The best of Europe’s second-tier competition for some time now, the Georgians have to make do with a kit template that’s, generously, two years old. There’s an argument that the colored “T” on the front makes it look like a bikini top, too. Notes: The Namibians are one of the most unsuccessful teams in the tournament’s history (their best result is a 15-point defeat), and their shirt is a bit of a hodge-podge. That said, the pinstriping on the jersey front is quite nice, even if the side vents are pretty ugly. Notes: The Irish are one of the tournament favorites, and their shirt is a very clean and classy number. Similar to the All Blacks, we get a retro chevron design around the shoulders, and another 3D injection-molded badge. The black and green change shirt is truly ugly, however. Notes: Les Bleus took the interesting step of bringing out a new shirt for the World Cup that, er, wasn’t really new. Both home and change are identical to those worn in the Six Nations, with one difference -”“ a motif around the famous Cockerel badge by famous French rugby captain turned renowned sculptor and artist Jean-Pierre Rives. Notes: Compared to their Six Nations shirt, this Italy shirt is a little dull, with the only real point of interest being the bafflingly nautical blue and white striped collar. The alternate shirt is a thing of understated beauty, however. Notes: Unlike Georgia, Canada is using Under Armour’s current rugby template. 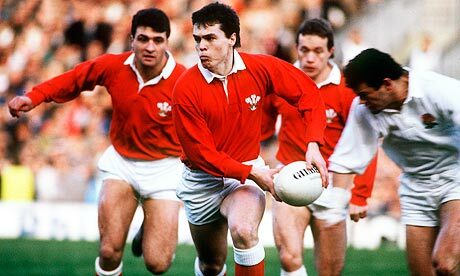 As with Wales, it’s made for two very retro-looking jerseys. By taking away the Wales design’s bands around the shoulders, however, it makes for a pretty plain, pretty dull design overall. Notes: The funky patterns on the front of the Romanian jerseys are apparently taken from the country’s traditional rugs. The home shirt is odd but unique, while the away design is lovely but er, well”¦ there’s no getting around it: It’s a touch phallic. So there we have it: 20 teams, 40 shirts, some absolute stunners, and some you’d probably rather forget. Yesterday, to no one’s surprise (and as Paul alluded to), the New Orleans Pelicans unveiled their new “Pride” uniforms (which had been leaked a while back, along with just about every other new NBA uniform for 2015-16). These mark the return of the “Mardi Gras” look, which harkback to the uniforms the team most recently wore when the team was still called Hornets. If you remember those uniforms, however, they were purple in front and green on back, with a gold side panel separating the two. The unis were shown off at Mardi Gras World in New Orleans, LA, and featured Pelicans Anthony Davis, Jrue Holiday, Ryan Anderson and Quincy Pondexter. Unfortunately, there weren’t any “glamour” shots available, so we’ll have to make due with a couple photos and a few closeups the team tweeted. The uniforms, which can be worn six times throughout the season, will be featured throughout Mardi Gras season including three home games: Saturday, Jan. 30 vs. Brooklyn, Monday, Feb. 1 vs. Memphis and Thursday, Feb. 4 vs. the Los Angeles Lakers on TNT. The match-up with the Lakers will be the Pelicans’ signature Mardi Gras-themed game. The other three games in which the Pelicans will wear the “Pride” uniforms will be on the road: Wednesday, Feb. 3 at San Antonio, Saturday, Feb. 6 at Cleveland and Monday, Feb. 8 at Minnesota. The uniforms were introduced as part of the NBA’s “Pride” uniforms for the 2015-16 season. The short-sleeved uniforms feature Mardi Gras’ signature colors ”“ purple, green and gold. The tops are purple with green accents on the sleeves and sport ”˜NOLA’ across the chest in the Pelicans’ signature font in gold letters trimmed in green. The Pelicans ”˜NO’ logo is featured at the bottom of the v-neck and the Crescent City Basketball logo is on the left sleeve in Mardi Gras colors. Additionally, the trim around the neckline is purple, green and gold-striped. On the back of the jersey, the players’ numbers will be gold with green trim, last name in white traditional lettering and the NBA logo will be featured at the base of the neck. The purple shorts will have green and gold stripes down the side with a small secondary logo ”“ the ”˜bird-de-lis’ in gold centered on the waistband. The Pelicans’ partial logo is on both sides of the shorts in Mardi Gras colors. The unveiling of the uniforms follows the NBA’s progression for teams that introduce a new identity. The first season, home and road uniforms are released, followed by an alternate uniform. The third year, teams can add a “Pride” uniform with required sleeves. The “Pride” uniforms utilize indigenous design elements or phrases or colors that are linked to the team’s local culture in a manner that enhances and extends the team’s identity. While this has been the Pelicans party line all along (first year, home/road, second year alt, third year more) — it seems teams who change their identity don’t include teams who merely introduce new uniforms — as they seem to be able to add three or four new sets at the outset. And don’t the Hornets (nee Bobcats) count as a “new identity” as well? But they introduced three unis that first year after “rebranding”. I think the Nets, when they moved from Jersey to Brooklyn may have followed this protocol, but that may have been because they really wanted to move that black jersey. I’m just not getting what constitutes a “new identity” — is it merely new uniforms, is it a move to another city, is it a name change/rebrand? Also, note that in the third year, teams can add a “Pride” uniform with required sleeves. What? This is the first I’m hearing of this requirement. All of this seems a bit strange, and doesn’t seem to apply to any other teams in the league. Did I miss some memo or are the Pelicans operating under a different set of uni restrictions (not that that’s a bad thing) other teams are not? I don’t follow the NBA all that closely, so I may be wrong in my (mis)understanding, but this seems to be an odd set of rules they’re following. As far as the uniform goes? I like it about as much as one can like an alternate — the colorscheme has been done (by the New Orleans Hornets, which is the same franchise as the Pelicans) before, albeit without sleeves and with green backs. So it’s not entirely “new.” And it’s kind of fun — since they’ll only be wearing it six times, it won’t be overdone. Of course, I detest the “required” sleeves, but other than that it’s pretty solid. What do you guys think? Let’s hear your thoughts in the comments below. Baseball News: Whoa — check out this photo of Ty Cobb batting and wearing sunglasses (from Jonathan Daniel. The link from which that photo came explains had undergone a surgical procedure on his eyes to remove a small growth from his left optic nerve and wore dark, smoked sun-glasses to prevent irritation to his eyes. … Here’s an interesting article about the Classic Wrigley Field Scoreboard (nice find by Tom Hamann). College Football News: New helmet for Texas Tech? Joey Potts was watching a video of Kliff Kingsbury and this helmet on his desk caught his eye. Chrome six shooter decal with smoke effects on helmet. “This is the best screenshot I could get,” he adds. … This guy has some divided loyalties: “Sorry for the photo quality, but I shot this with my phone through my windshield at dusk,” writes Andrew Hoenig. “That is a Virginia license plate with a U-Maryland frame, but a Miami Dolphins helmet sticker over the original plate graphic.” … Here’s the North Carolina Tar Heels uniform combination for their upcoming game (h/t James Gilbert). Also from James, here is a local columnist’s take on Carolina’s new uniforms. … The Arizona State University Sun Devils will be having a white-out tonight against New Mexico (from Joey Artigue). … For data nerds, check this out. Submitter Susan Freeman, adds, “Oh. My. God. No need to crunch the numbers on your own! Just look at this!” … An adidas exec claims Louisville’s new black unis “really pop”. Oh, really? … Virginia is going to be wearing beautiful throwbacks for their game this weekend (h/t Fins Phanatic). 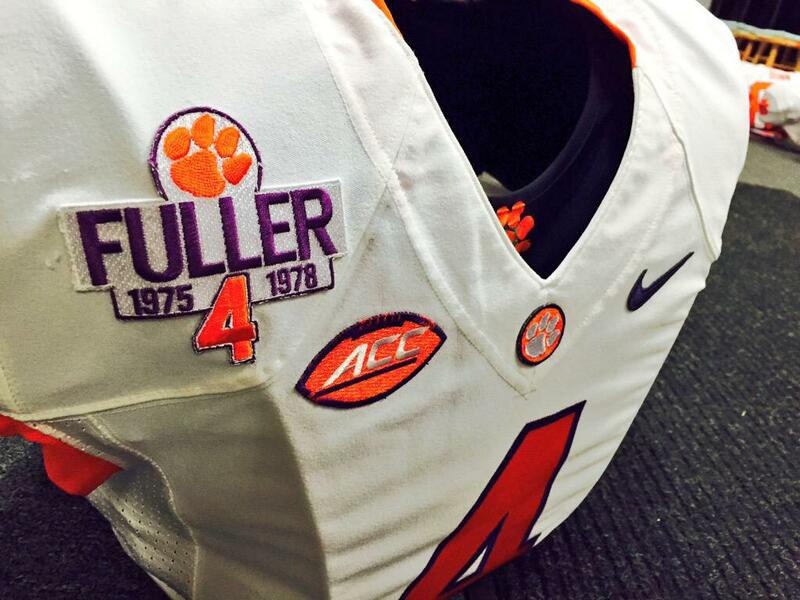 … Here is a close up of the patch DeShaun Watson wore last evening vs. Looeyville (via Emblem Source). … The Illinois Illini will wear orange/white/orange Saturday against North Carolina (from Illini Football). … Fordham is readying their flag desecration unis for their Liberty Cup game against Columbia on Saturday (from Matthew Solly). NBA/College/Basketball News: Here’s a look at the new red Bradley Basketball uniforms (from Andrew Carver). .. Take a gander at this beautiful Boston Celtics program long playing record (from Jesse Scardina). Jesse notes, “Found this gem ”” never recall seeing the basketball with a clover logo on it.” That’s a new one on me too. Anyone know if that was ever an official logo? Hockey News: Goalie Carey Price has new pads. Mike Engle adds they’re still CCM E Flex Pro 2, just a different way of coloring in the template this time. … Michigan State University’s Munn Ice Arena is going with green blue lines (thanks to Eric Romain). … New gray uniforms for THE Ohio State University hockey team (from Patrick Thomas). … Check out this new mask for Robin Lehner of the Buffalo Sabres inspired by the band IN FLAMES (from Scott Turney). If you want to know more, click here. … Here’s an “on ice” look at the new Coyotes unis (which were unveiled this past June — from Yardbarker). … Cam Neely dropped a hint tonight as to what the Bruins’ Winter Classic jerseys will look like (from Will Lombard). Soccer News: “You might be interested in this article about how a BFBS fourth jersey from the Italian club Lazio is a bit problematic,” notes Matthew Rogier, “given some of its supporters fascist tendencies and the history of ‘Blackshirts’.” … Here’s a look at the new, radical third kits across Europe’s top teams. … Retro Jamaica jerseys have been released, and according to the author of this article, they’re “almost too beautiful to look at”. They are pretty freakin’ nice tho. … Looks like UCF soccer is wearing fauxbacks today (via Eric DeSalvo). … The National Women’s Soccer League revealed their logo for their championship game (from Saurel Jean). Grab Bag: If you want another view of the Rugby Union World Cup jerseys, you can click here. Says submitter Caleb Borchers, “saw this article, find the analysis pretty off to my tastes, but fascinated a Uni Watch type piece is popping up internationally.” Also from Caleb, “So the advertising tail is wagging the dog at this Rugby World Cup. The All Blacks will be changing on the bus due to sponsorship rules.” … During a 2014 women’s rugby union match between England and Scotland, several of the Scottish forwards wore blue and white thigh strapping (from Grayham Clayton). … “Knowing of your keen curling interest, this is priceless,” says Terry Haines. “Feherty and curling. A match made in heaven, or at least 30 Rock.” … Hugh McBride asks, is this the First (ever) public appearance of throwback unis? HAH! … Interesting article asks “When did logos get so friendly?” (thanks, Brinke). … Ed(die Atari) Westfield thinks this is a Nice Bernie Sanders t-shirt. And that’s all for today — thanks to Josh for the lede (and Paul for prepping it) and all who sent in for the ticker. I’ll be back tomorrow for a normal Saturday posting (and SMUW on Sunday), filling in for Paul on Monday & Tuesday, and Paul will return on Wednesday and we’ll be back to our “normal” Uni Watch schedule after that. Everyone have a great Friday and I’ll catch you guys tomorrow. I don’t know what Andrew Hoenig is talking about – that’s just a standard-issue VA Hybrid vehicle tag. The ‘Miami Dolphins’ logo he’s looking it is a globe. 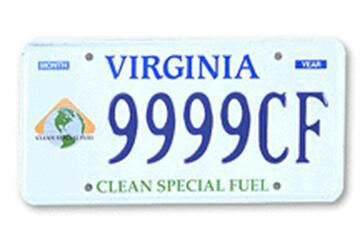 Specifically, it’s the Clean Special Fuel plate issued before July 1, 2006, according to the Virginia DMV site. Here’s a larger example. Yep, and to take the detail one step further – this partucular Terp must have had a Hybrid prior to the Lincoln in the picture, as it’s a 2011 or 2012 model. Plus the personalized license plate makes his allegiance to UMD apparent. His loyalties are actually consistent (the foolish decision to domicile in VA notwithstanding, that is). Isn’t the “combination ship’s wheel and compass” a basketball? Hmmm…a graphic image that looks like a basketball on a uni. Why didn’t I think of that? In all seriousness, yes, it’s a “basketball,” but if you were to see the image in isolation as just a graphic, it resembles things (at least to me) besides a basketball, like a compass or ships wheel. Or a crosshairs with an “N” inside. Or a basketball. Those NFL record sleeves were highly disappointing to me. I’m not sure what I was expecting, but it wasn’t that. Yeah, I agree. I mean, I’ve seen a *few* album covers which are in that style, but it’s a very specific and unusual style. And some of the elements don’t really fit the teams, either (when do the Giants use that “NY” logo?). 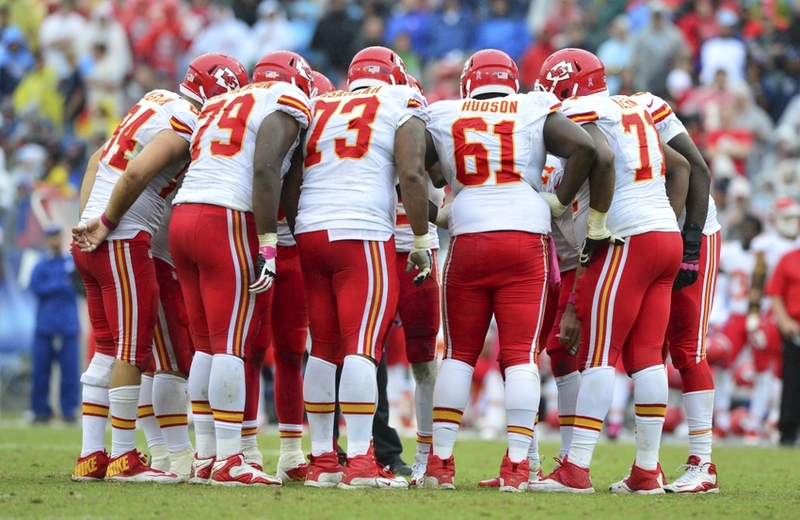 On another note–only the NFL would “strongly encourage” color-vs.-color matchups, yet still maintain the rule limiting teams to wearing their alts twice a year. That’s just plain stupid. If you want to encourage it, then make an exception. If they don’t actually care, that’s fine, but if it’s your goal, then for what possible reason would you not have the Broncos wear their alts there, without counting it toward the limit? RE: Gronk’s dad being too cheap to buy a real jersey…. Too bad the rest of the family wasn’t too cheap to be completely outfitted in Zubas gear. Yikes! Interesting to see three teams wearing chevrons, a uniform feature most associated with rugby league. And I thought most unions wouldn’t want to be confused with that “peasant” sport. Also this could be a good indication of what adidas will do with the NHL since they seem to really respect these country’s traditions. Well they don’t during non cup years but for the big moments they keep it clean. Could be the pic, but I’m pretty sure that UNC uniform poster has Nikelace superimposed over the argyle neckline. Anybody else seeing that? Cheesy Photoshop work for the Carolina Cheeters graphic staff. The design equivalent of “Lipstick on a Pig Pickin'”. Sorry to be one of those commenters but Samoa’s kit supplier isn’t Asics, it’s BLK. And Romania doesn’t have its kit supplier provided, also BLK. And “fart is a lift” is a perfect description of the wallabies jersey (jaded Aussie here). Nothing to apologize for; as long as we’re polite about it, the writers appreciate the help. For instance, I’ll mention that there’s an extra right parenthesis at the end of the Coyotes item. Does anyone know where the Rugby World Cup can be seen in the US? My late father was volunteer “hole captain” on the penultimate hole of a PGA tour event for 15+ years, and had probably a dozen brief encounters with Feherty. Told me he was a total prick on virtually every one of them. That North Carolina-Illinois game could be a candidate for the 5&1. Orange-white-orange vs. White-blue-white? Sounds gorgeous! Was discussing this on the Twitter last evening — definite good “1” potential there. That’s not a Celtics program, it’s a Celtics LP. Ah, yes — a Long Playing record — good catch; now fixed. I don’t understand the harshness of the judgement of Canada’s rugby kit. Other nations use mono-colour, it is “classic”. Canada does the same = dull Um, our flag only has two colours. What are we supposed to do? 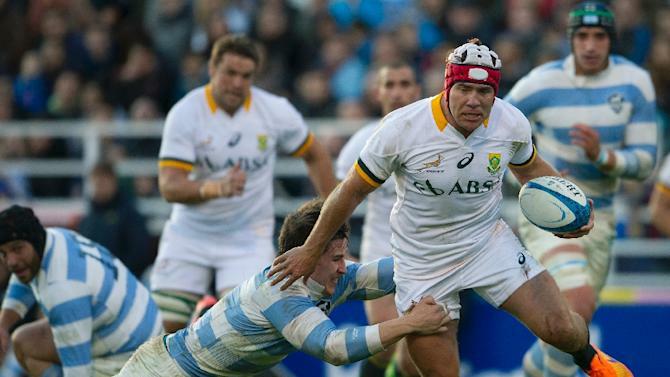 Most of the rugby jerseys shown exhibit the same tacky, poor design we see in other sports. Bad panels, striping, and tone-on-tone effects. The solid ones like Canada, Scotland, and England are by far the nicest, and certainly not dull. For the womens’ 15s Under Armour has mixed in some black, and there’s also a black jersey choice. That USA Rugby badge reminds me of our late, unlamented Atl*nta Thr*shers primary logo. Is this the first time we’ve seen a patch on an NBA sleeve? Or have other teams already done that? Is it only on Thurs night games that NFL teams can go color vs color? While my beloved Bears only have one Thurs game this year (Thanksgiving at Green Bay–navy vs forest green would be bad) it would be great to see the Bears’ navy vs powder blue Chargers on a Monday night (Nov 9). 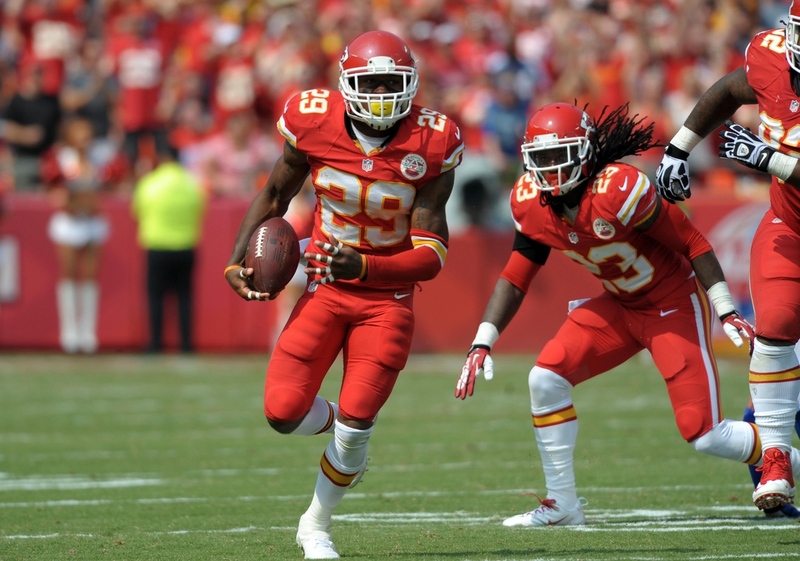 Bears color vs color against 49ers (Dec 6) or in Kansas City (Oct 11) would be great too. I think they’re still technically allowed to do it other games, but they have to have league permission ahead of time. Honestly, I’m not entirely sure that “color on color” and “color vs color” actually mean the same thing to the NFL. We’ve had 2 Thursday games – the Steelers & Patriots looking perfectly normal, and the Broncos & Chiefs with KC going mono-red. Maybe they just mean they want one team to wear a colored jersey on top of colored pants. Until we actually get a color vs color game, I’m going to remain skeptical. -Scotland are my fave design this year. Love the tartan. -You can also watch RWC via online PPV. $30 a game, $200 for all 48 matches. -Yes the USA logo looks like the Thrashers, but it’s existed for much longer. I’ve always been shocked USA Rugby didn’t go after the NHL for some sort of copyright infringement. -I think the reason Canada’s jersey looks bland instead of classic is history. Canada has for most of the last decade plus worn some sort of black and red mixture. So much so I wouldn’t even call it BFBS, just part of their look. So red and white just looks blah IMO. England’s 2-tone red alts need something, but I’m not sure what. The jerseys on the refs look great, but sponsored? Really? The teams go without sponsors in the world cup and look fantastic. Fly Emirates on the refs is an eyesore. If I were a Puma executive, I’d be working hard to see what it would take to get the Pumas’ account away from the swooshketeers. NOLA unis: Like them, but they should be called Carnival unis instead of Mardi Gras. Otherwise, they should only be worn on the day before Ash Wednesday. Even then, they should only be worn from Jan. 7th to Fat Tuesday. Bradley hoops unis: I’d wear that! Nice readable outline number. …I see the Pelicans are actually wearing them during the actual Carnival season. Good on them! New Orleans is such a unique city that I would expect the Pelicans to have a Mardi Gras themed uni somewhere in there. Aside from the sleeves I like it. As far as I am concerned, ANY NOLA team should have a Mardi Gras alt, including the Saints. Couple of extra bits of info regarding the Rugby World Cup that are interesting. 2. 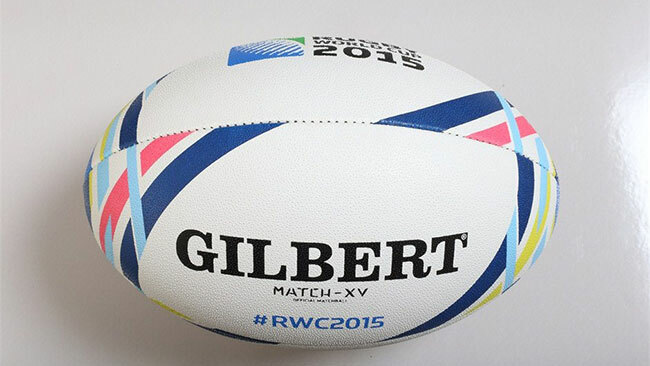 This is the first world cup since 1991 to use match balls that are not coloured exclusively in green, white and blue- the colours of the International Rugby Board. I haven’t found anything to explain the peculiar colours or ribbon pattern for this tournament’s ball other than that they “enhance visibility”. 3. While the teams play without ad, the referees jerseys are sponsored for the first time in the World Cup. As for the Scottish women’s rugby team and their thigh strapping, they are actually functional accouterments. The players wearing them are the second and back row forwards, the tallest players on the pitch usually and the ones lifted during lineouts. The strapping helps the lifters to get a better grip when throwing them up to compete for the ball. You can see here how they are almost molded into a sort of handle shape. It’s common to use team coloured electrical tape to secure the strapping in place. 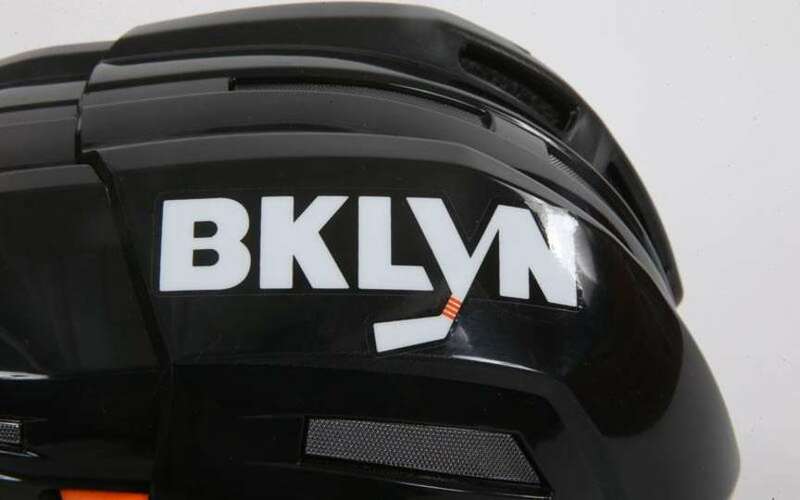 A bit late to the game, but I’m wondering if anyone else shared this thought about the new Islanders 3rds – I think the fact that they chose to mimic the Nets black/white color scheme for their “Brooklyn solidarity” uniforms is particularly ridiculous considering that the Nets have their own “Brooklyn solidarity” uniforms…which are blue and gray for the Dodgers. Still, I agree with the consensus that they are pretty nice as a standalone jersey. I would love to see the design in their actual colors. I tend to agree with your assessment that parts of the Islanders uniform are really cool. The most interesting part is the helmet sticker. I’d buy that on team merchandise. The Islanders and the Nets now share a pretty dynamic venue in Barclays Center so I have no issues mimicking the Nets brand colors. Naeher is Hope Solo’s understudy. Does anyone know why ESPN.com no longer posts photos from games in the box score area. It has become ritual for me to check out all of the college football game images on their site and can no longer do so.